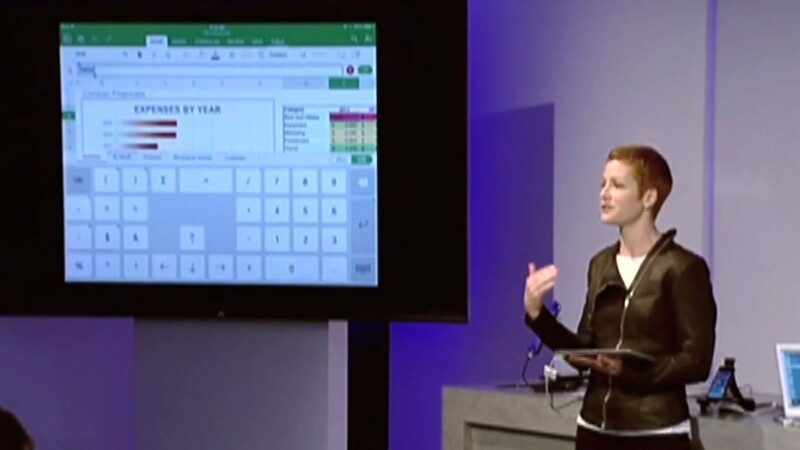 After years of speculation, Microsoft Office is finally on the iPad. In his first public appearance since being named Microsoft's (MSFT) new CEO, Satya Nadella unveiled the next evolution of Office. The ubiquitous productivity suite, which includes apps such as Office and Excel, has been optimized for use with touch screens and fingers. Microsoft had done some work on Office 2013 to make it more finger friendly, but with Office for iPad, it's a full-fledged step forward. The look of Office isn't radically changed, but many features have been subtly streamlined to make things less painful. The biggest difference is that Microsoft isn't trying to push every formatting option in front of your face, instead identifying the most essential features, and using that screen space to make those icons bigger. Microsoft Word, for example, closely resembles Word 2013, but the interface has been simplified to highlight just the most important formatting options. Text and images can easily be highlighted and manipulated with the finger--as is the case most iPad word processors. Microsoft Excel is able to interpret what type of data you're working with and automatically suggest formatting options to save time digging through menus for a specific type of graph. Powerpoint has been the most straightforward and tablet-ready product of the bunch, but on the iPad its as touch-optimized as you'd expect, allowing users to build presentations with a few taps and swipes. Also notable is the more pronounced integration of Microsoft OneDrive into Office. All documents are automatically backed up and synced to Microsoft's Cloud, with an easy-to-use interface. Multi-user collaboration has also been integrated deeper into the experience. That the tablet-optimized version of Office launched on Apple's (AAPL) iPad first, and not a Windows or Android tablet, is a testament to the influence of the iPad in the tablet space. But while all of what Microsoft showed off looks and sounds fine, it doesn't seem to solve the problem of productivity apps on touch devices as much as it just makes them more tolerable to use. Of course, the larger question is whether it matters that Office is now available for the iPad. For years, there have been scores of productivity apps available in the app store, including Google (GOOAV) Drive and Apple's own iWork suite, both of which are free. There have also been third-party apps, such as the word processor Writer Pro and the spreadsheet app Grid, which are helping to evolve or even reinvent the entire concept of what productivity software. But do enough people care that much about productivity and file compatibility on a tablet to make the leap to Office for iPad? That's a big, unanswered question. Office for iPad will be available in the iTunes App Store on Thursday afternoon for free. But only reading documents will be free. Those wanting to create and edit content will have to purchase an Office 365 subscription, starting at $70 a year.